CAL is a voluntary organisation which campaigns to achieve urgently and sustainably full compliance with World Health Organisation (WHO) guidelines for air quality throughout London and elsewhere. Traffic is a major cause of air pollution in London, which in turn causes thousands of premature deaths per year, and many thousands more illnesses, chronic illness and disability. For this reason, traffic measures are also measures to deal with air pollution. “Clean Air in London estimates that Oxford Street breached the nitrogen dioxide (NO2) hourly limit value for the whole of 2015 on 4 January. Putney High Street is expected to breach on 5 January. Brixton Road will breach soon. “The Mayor has taken a succession of backward steps on his proposed Ultra Low Emission Zone (ULEZ) since announcing it two years ago. The gap between what the Mayor says and what he needs to do and actually does has never been wider. “Meanwhile, concerns about air pollution, particularly NO2 and diesel exhaust, have risen exponentially. Leading scientists say that many roads in central London will tend to have the highest NO2 concentrations in the world. “Monitored annual mean concentrations of NO2 at selected locations in London in 2014 were: Euston Road 98 micrograms per cubic metre (ug/m3); Putney High Street 101 ug/m3; Walbrook Wharf 122 ug/m3; Oxford Street 139 ug/m3; Brixton Road 149 ug/m3; and Marylebone Road 79 ug/m3. NO2 hourly exceedances at these places respectively: were 170; 999; 672; 1,361; 1,732; and 12. These compare with legal limits of 40 ug/m3 and 18 hours. Of these results, only Marylebone Road is reported by Defra to Brussels. Defra is currently consulting on plans that would scrap most, if not all, the five other local monitors. “London needs to ban diesel from the most polluted places by 2020, as coal was banned so successfully 60 years ago, with a meaningful intermediate step by early 2018. The Mayor seems to have a love affair with diesel that must end. The Mayor’s proposed ULEZ is too small, too weak and too late. The Mayor announced his plans for the so-called ULEZ on 13 February 2013 when announcing also his plan to scrap Phase 5 of his own low emission zone that had been planned for 2015. “The Mayor of London has announced his intention to create the world’s first Ultra Low Emission Zone in central London, in a move that he believes will deliver dramatic benefits in air quality and provide a major spur for the further development and mass take-up of zero and low emission vehicles. He has asked Transport for London to prepare plans to look at introducing a scheme that would aim to ensure all vehicles driving in the centre of the capital during working hours would be zero or low emission, and the feasibility of introducing such a scheme from 2020.” CAL emphasis. 4. in November 2014, proposing a 100% discount until September 2023 for some 30,000 residents currently claiming a discount on the Central London Congestion Charge. As you know, CAL has also lodged a complaint with the Advertising Standards Authority that Londoners may be wildly misled by the Mayor’s claims of reductions in vehicle pollution in one or more of the ULEZ consultation advertisements. The gap between what the Mayor says and what he needs to do and actually does has never been wider than on air pollution and the ULEZ in particular. In the last two years, knowledge and concerns about air pollution, particularly NO2 and diesel exhaust, have risen exponentially. 1. the WHO highlighting the dangers of NO2. The WHO published two ‘state of the art’ reports on the health impacts of air pollution in 2013 and classified outdoor air pollution and fine particulate matter (PM2.5) as carcinogenic to humans in October 2013. 2. the Mayor predicting breaches of the PM10 Air Quality Objective in 2020 (pages 22 and 29). The ULEZ will also do virtually nothing towards meeting the challenging and important exposure reduction target for PM2.5 in London by 2020 (page 177). 3. the European Commission commencing infraction action against the UK on NO2. A ‘Final written warning’ (a.k.a. Reasoned Opinion) is expected soon. 4. CAL finding diesel vehicles are responsible for about 90% of the PM2.5 and NO2 exhaust emissions in London. Others have published evidence that the new Euro 6 standards are not working for diesel. On average, on-road emissions of oxides of nitrogen (NOx) from the diesel vehicles tested by ICCT were about seven times higher than the limits set by the Euro 6 standard (meaning that TfL’s projected reductions in computer modelled emissions by 2020 are largely illusory). CAL uncovering evidence of the widespread removal of factory-fitted diesel particulate filters. The Mayor seems to have a love affair with diesel which must end. 5. world leading scientists at King’s College London warning that many roads in central London will tend to have the highest concentrations of NO2 in the world. Monitored annual mean concentrations of NO2 at selected locations in London in 2014 were: Euston Road 98 micrograms per cubic metre (ug/m3); Putney High Street 101 ug/m3; Walbrook Wharf 122 ug/m3; Oxford Street 139 ug/m3; Brixton Road 149 ug/m3; and Marylebone Road 79 ug/m3. NO2 hourly exceedances at these places respectively were: 170; 999; 672; 1,361; 1,732; and 12. These compare with legal limits of 40 ug/m3 and 18 hours. Of these results, only Marylebone Road is reported by Defra to Brussels. Defra is currently consulting on plans that would scrap most, if not all, the five other local monitors. 6. ClientEarth winning its legal case against the UK Government in the Supreme Court and then again in the Court of Justice of the European Union. 7. the Mayor’s own Health Impact assessment for the ULEZ revealing for the first time the NO2 mortality impacts of NO2. 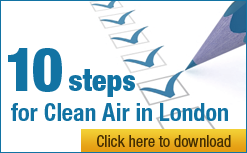 CAL estimates 5,061 deaths attributable to PM2.5 in London in 2020 and 5,159 in 2025. These compare with the Mayor’s estimate of 4,267 for PM2.5 in 2008. CAL estimates 2,684 deaths attributable to NO2 in London in 2020 and 1,893 in 2025 with up to one-third overlap with PM2.5 giving totals of 6,851 and 6,422 attributable deaths in 2020 and 2025 respectively. 9. the European Commission announcing its Clean Air Policy Package in December 2013. New commitments to the Package followed recent threats by President Juncker to delay or scrap it. 10. a statement from COMEAP is expected imminently on NO2 mortality with local estimates of mortality to follow this year. 12. CAL estimates London breached the NO2 hourly limit value for the whole of 2015 in Oxford Street by 4 January. Putney High Street is expected to breach on 5 January with Brixton Road following soon. The excellent London Air Quality Network confirmed on 5 January the breach of the NO2 hourly limit value in Oxford Street for 2015. On 6 January, the LAQN confirmed the breach by Putney High Street on 5 January. The Mayor needs to ban carcinogenic diesel exhaust from the most polluted places by 2020, as coal burning was banned so successfully 60 years ago, with a meaningful intermediate step by early 2018. CAL explained the scale of action needed for the ULEZ in a letter to the Mayor dated 7 December 2013. Everything CAL said in that letter still stands and so please consider it again as an integral part of our response to this Consultation. CAL will not repeat it here. Particularly disappointing is the Mayor’s lack of ambition after he has identified what needs to be done. Only by banning diesel exhaust from the most polluted areas, 24 hours a day seven days a week, will it be possible to comply with WHO guidelines for NO2 by 2020. In March 2014, TfL published the map below showing what could be achieved by setting a zero tailpipe emission standard in 2020 i.e. in practice this requires only a ban on diesel exhaust as petrol emissions are such a tiny proportion of the total for NO2. Of course, real world testing should be used to determine which petrol vehicles should be banned from the most-polluted areas to support this aim. This is exactly what is being discussed for Antwerp, Brussels, Madrid and Paris. Rome already bans non-residential vehicles from its centre. A primary ULEZ should ban all four year old diesel vehicles and all 10 year old petrol vehicles from the area bounded by the North and South Circular roads by early 2018 and all diesel vehicles from that area by January 2020. Secondary ULEZs should tackle the most-polluted other areas e.g. around Heathrow and in east London. Many London boroughs have indicated their support for bold action on the ULEZ and other measures to tackle diesel exhaust. I would be pleased to discuss these points with you.